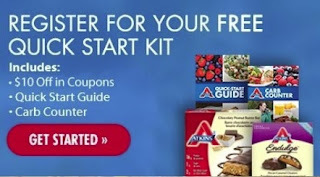 Home atkins , coupons , dieting , health , men , women FREEBIE: Atkins Quick Start Kit + Coupons! FREEBIE: Atkins Quick Start Kit + Coupons! Register for your FREE Quick Start Kit - $10 in coupons, Quick Start Guide, and Carb Counter. It let me print the coupons on the website, and then it also sent me an email link for the coupons, and so I was able to print them again! -- This 64 page Carb Counter fits in your pocket. The counter lists the Atkins acceptable foods, along with a few chain restaurant selections for eating low carb on the go. The Atkins Carb Counter and Acceptable Food Lists make it easy to find the net carbs in your favorite low carb foods.